Today was such a wonderful day! Seeing our "big" baby for the first time was indescribable. Our last sonogram was at six weeks and even though we saw our little bean and the heartbeat, it was just ten times better this visit. We actually saw a little face, body, hands, feet, button nose. Ahhhh! 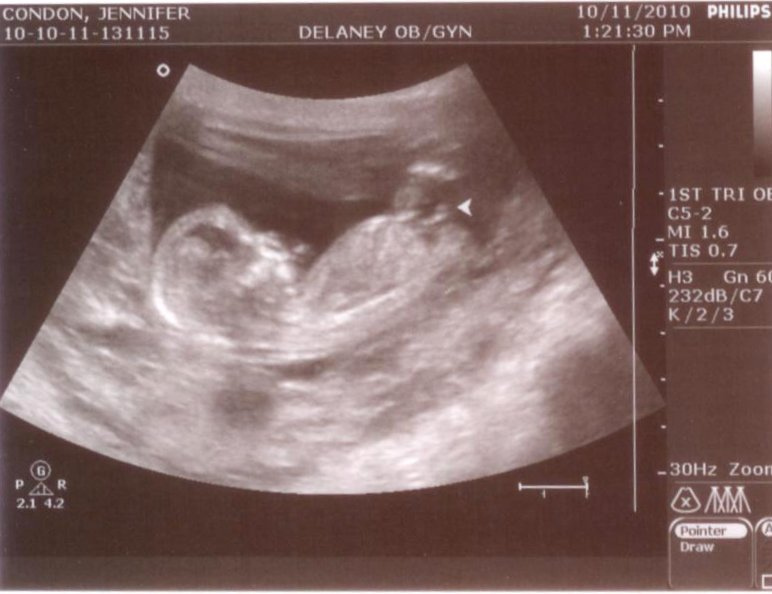 The first part of our sonogram was the genetic test where they measured the fluid in the back of the baby's neck. Our measurement was 1.3 and anything over 3 is to be concerned about. We passed one out of two parts of this screening. I also had labs drawn and we will receive those results in four weeks. Baby C wasn't cooperating the first five minutes of it's big reveal. The technician had to keep poking my belly to make it move. Rich and I were glad the baby was being stubborn, just like it's parents. We got to spend extra time looking at our bundle of joy. After the genetic test was complete, we were given the o.k. to videotape our sesh (see below). 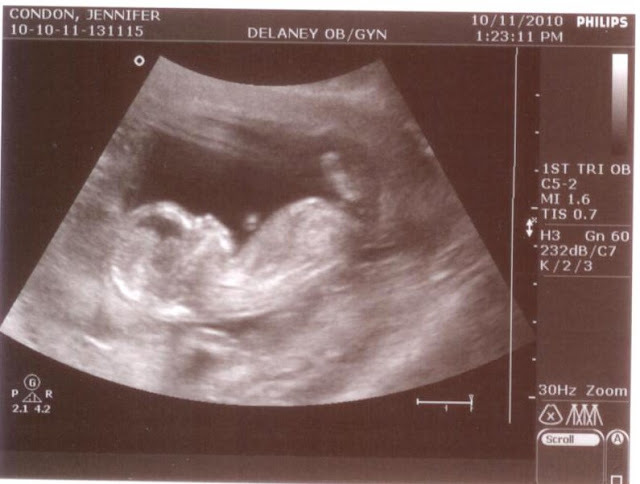 Nosey little me also had to inquire about possibly seeing the gender. We got a good sneak peak in between the legs and got a possible "boy" result. The only thing at this point is that the male and female genitalia are the same. They're distinguished by the angle of the dangle.. the direction it is pointing in. We were told by the technician that it looked as if Baby C's dangle was pointing North, but this all depended on exactly what angle the baby was laying at. We were also told by the doctor that their tech is usually right, but we'll confirm once and for all in exactly 2.5 weeks. Since we've been home, I can't stop looking at our baybay's picture. This is just so amazing! The "dangle" pic sure does look like it's pointing East to Rich and I, but what do we know?! What do you think? ...and here she/he is dancing around like it's their job. ENJOY! Amazing-so incredible! Technology has made the pictures so much better-I don't remember seeing anything this clear with mine. You can breathe a huge sigh of relief now. Fantastic! They sure are cautious these days; I never even had a sonogram while pregnant with Jonathan!